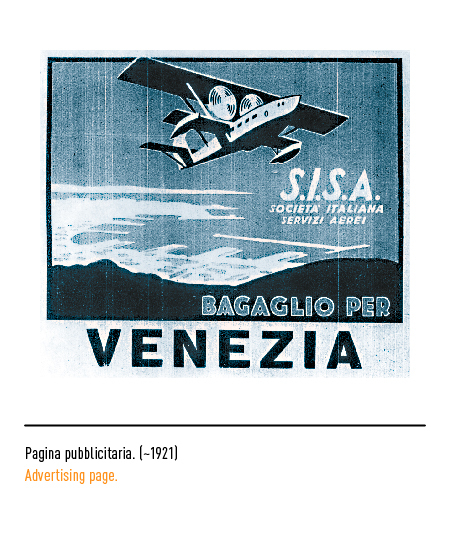 It was 1926 when SISA, an acronym for "Società Italiana Servizi Aerei", started running the ﬁrst regular passenger domestic ﬂights in Italy. 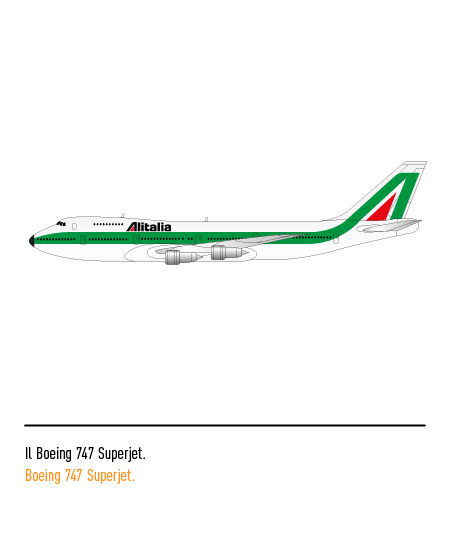 A number of other pioneering airline companies were quickly to follow. 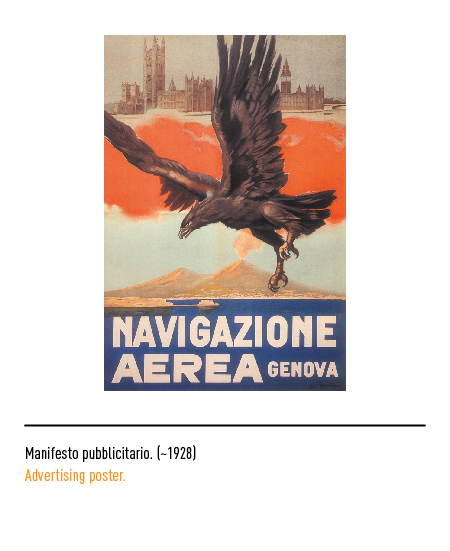 "Navigazione Aerea", a Genoa-based ﬁrm, ﬂew domestic routes, while international routes were covered by "Società Aero Espresso" and "Avio Linee Italiane". 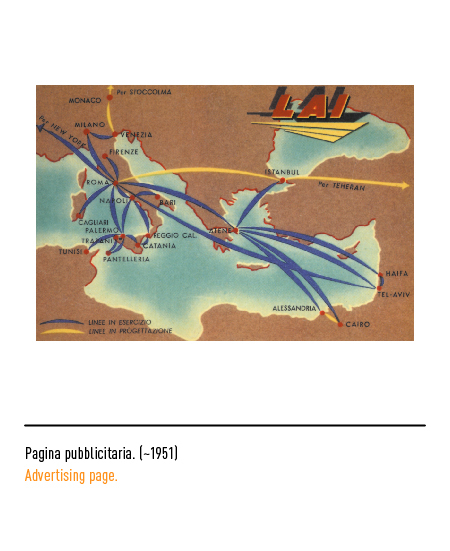 In 1930 a number of private companies merged to set up "Società Aerea Mediterranea", a ﬁrm that was taken over in 1934 by another carrier, "Ala Littoria". 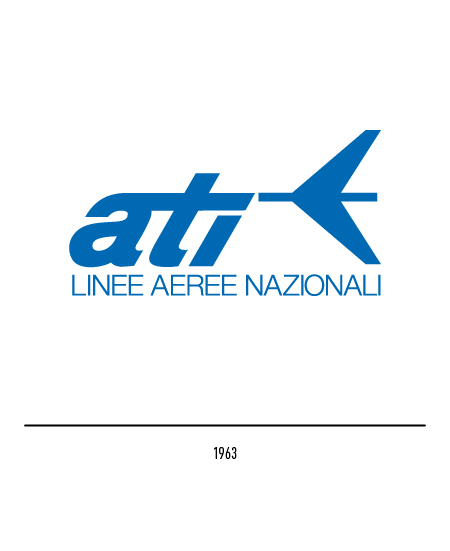 After World War II there were two airline companies in Italy, namely LAI (Linee Aeree Italiane) and Alitalia, both jointly run by the Italians, Americans, and British. 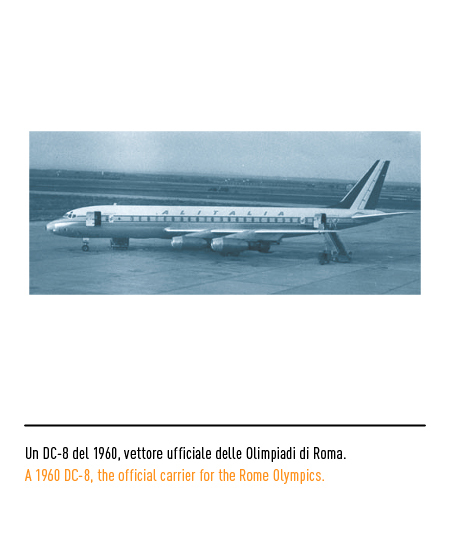 The ﬁrst domestic ﬂight was inaugurated in 1947 on the route Turin-Rome-Catania. 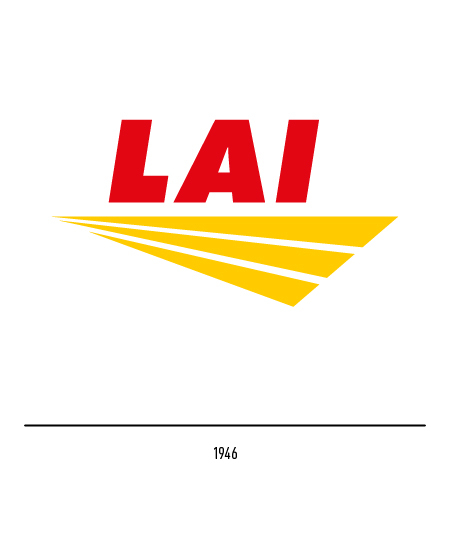 The LAI trademark was made up of three elements and the lettering was underlined by a stylised stretched-out wing. 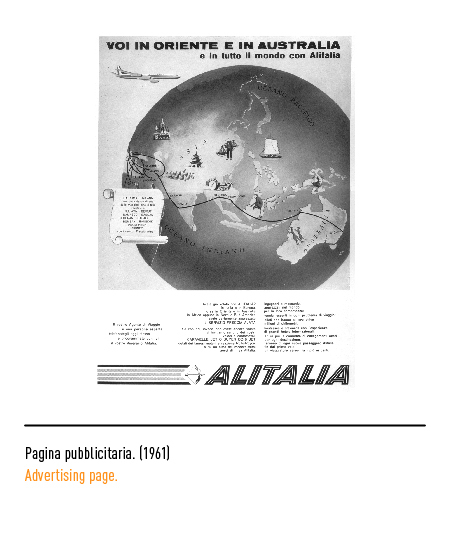 A nationwide public competition was launched in 1947 to select Alitalia's ﬁrst trademark. 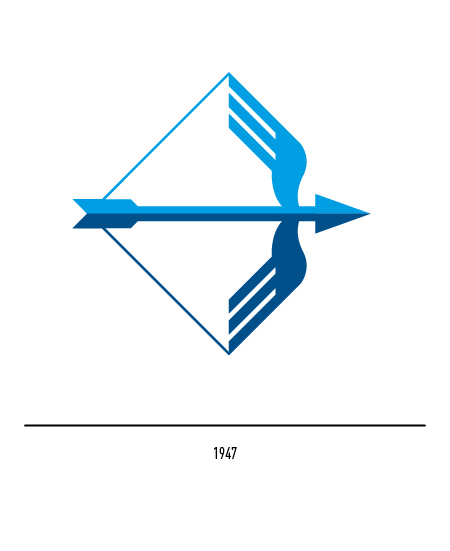 The winning entry portrayed a winged-shaped dark and sky-blue arrow. 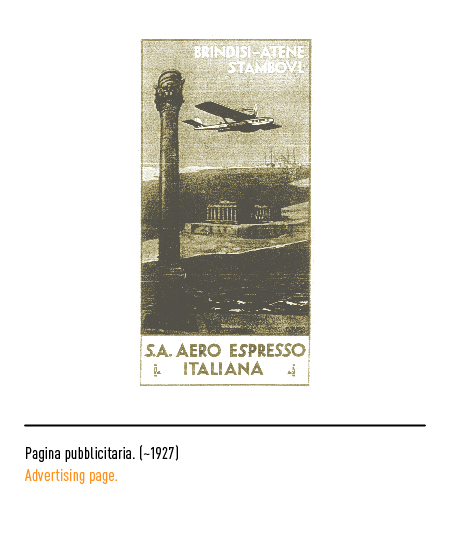 This device had already been used by Italian airborne squadrons during the First World War. 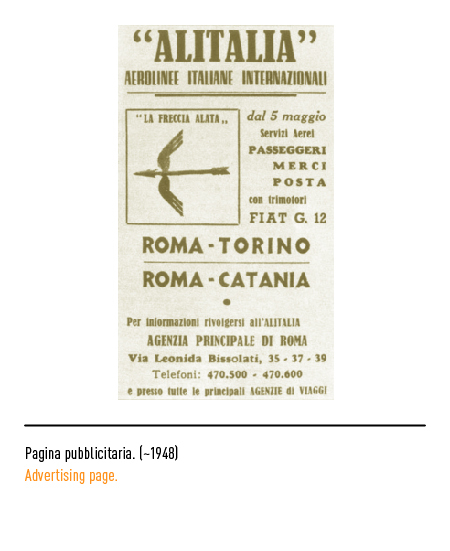 There was also a sky-blue trademarktype next to the symbol with upper case lettering composed in three bands. 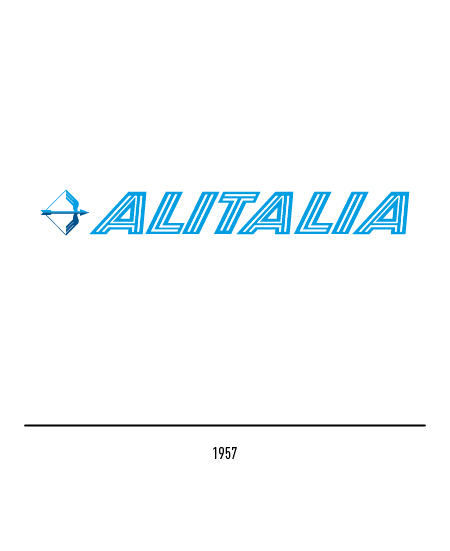 In 1957 the trademarktype underwent a slight restyling to adapt it to the merger of LAI and Alitalia. 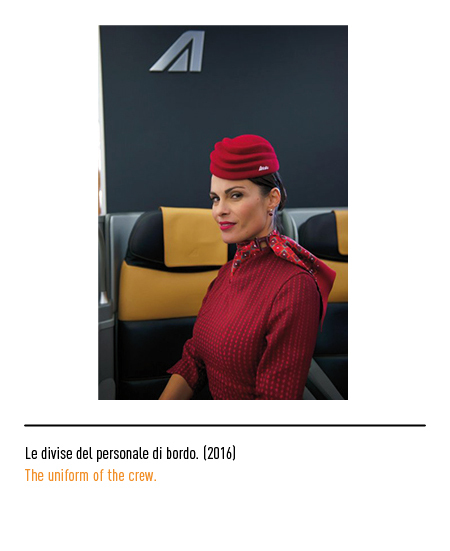 Henceforth the new airline carrier was run exclusively by Italian management. 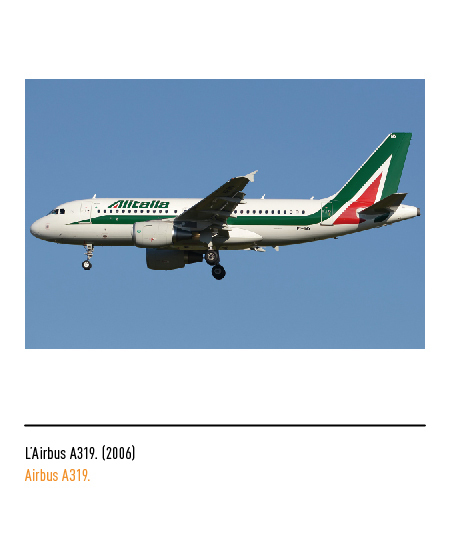 A domestic carrier by the name of ATI (Aero Trasporti Italiani) was set up in 1963 and in 1994 it was taken over by Alitalia. 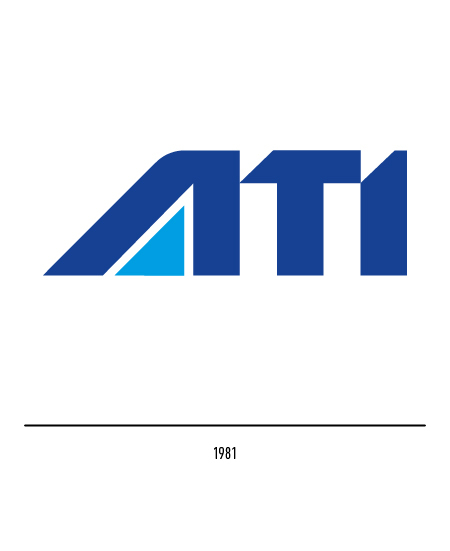 ATI's ﬁrst trademark showed the acronym next to a stylised aeroplane. 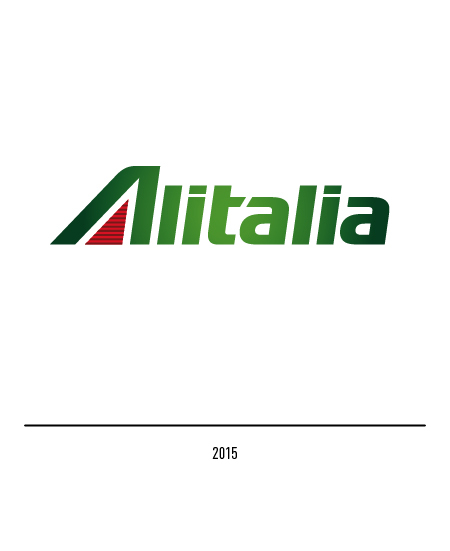 From a graphic-design point of view it must be acknowledged that Alitalia's symbols were not all that interesting. 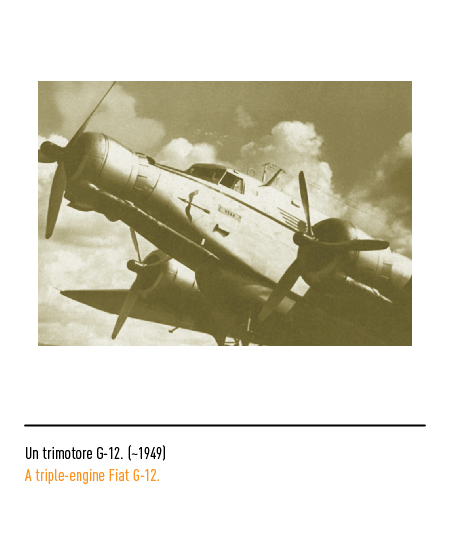 The winged arrow was barely visible on the fuselage and a rather conventional symbol in the sector at that. Its composition displayed hardly any creative graphic-design content and the lettering on the fuselage was rather anonymous. 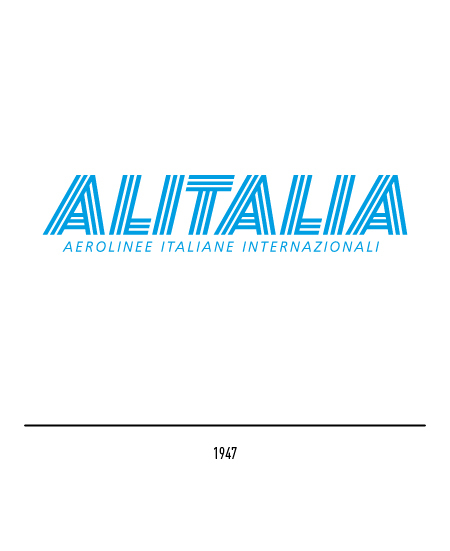 It was 1969 before Alitalia decided to run an international competition calling for proposals for a new trademark as part of an overall renovation plan. 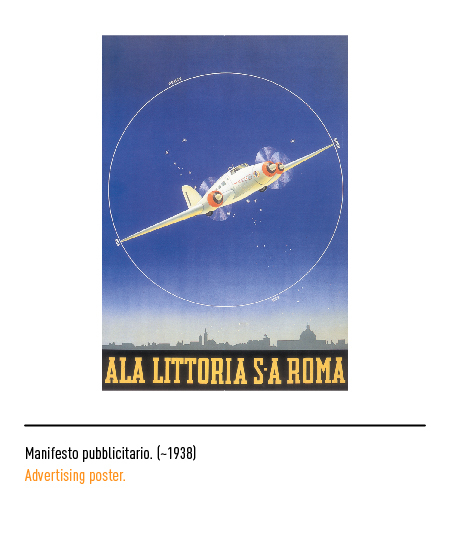 The winning entry was submitted by Landor Associates. 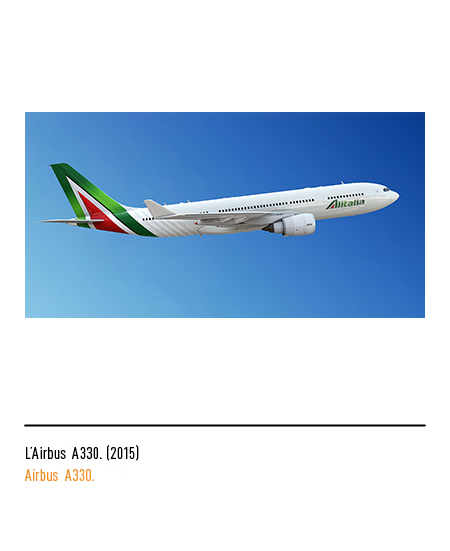 The tricolour of the letter "A" and tail-ﬁn afforded instant and unmistakable recognition of the national airline company and the original lettering on a green strip running the full length of the fuselage was a considerable communicative and aesthetic enhancement over the previous pentagram ﬁgure. 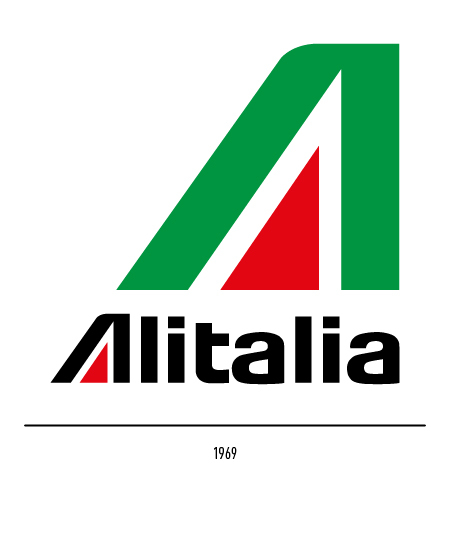 In 1981 ATI's trademark was also changed harmonising with that of Alitalia's but for different colours. 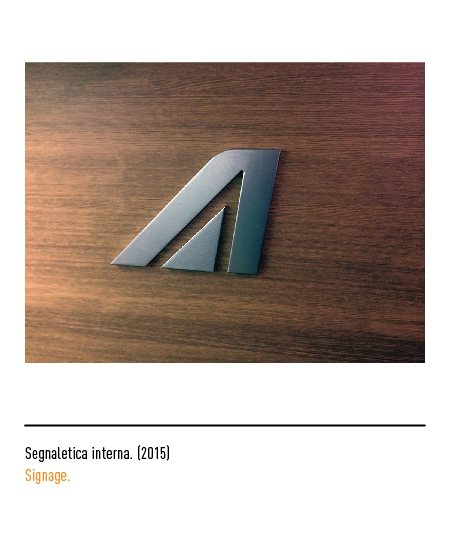 In 2005 to symbolize the repositioning of the company on the market it was decided the logotype restyling; the agency Saatchi & Saatchi opted for a gradient of logotype to the right and a partial rounding of the vertical rods. 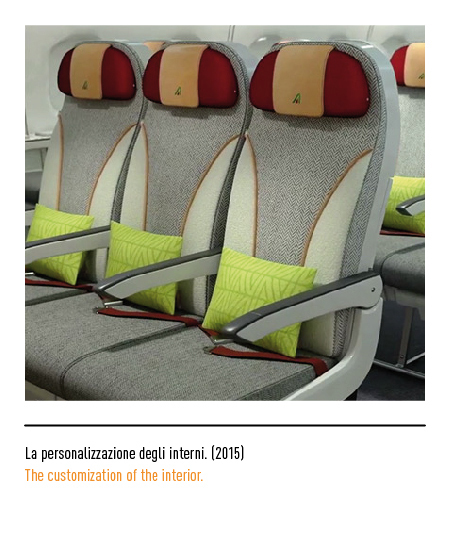 In 2015 the national carrier has launched a new phase of its renewal process by presenting the new visual identity, including the new livery, with the goal of establishing the company as an innovative and sophisticated leaders in the industry and represent the best of Italy in world. 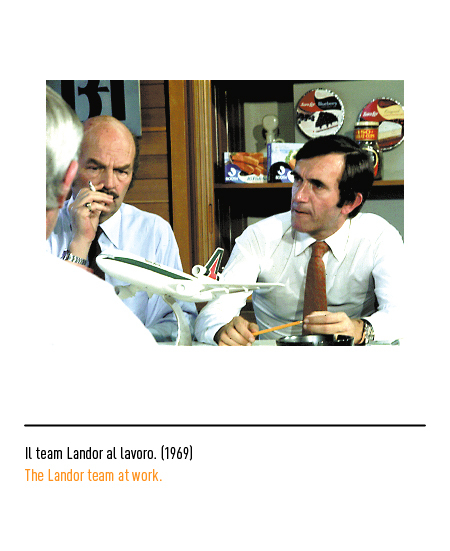 Landor has been commissioned to create the new brand by using elements of the previous design, designed by the same Landor in 1969. 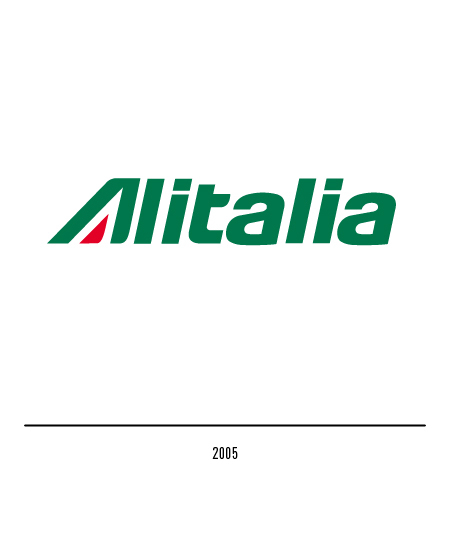 The brand has been modernized with the presence of the "A" most dominant and continuous joint between the letters "t" and "a"; for letters it has been preserved the color green with a glow in the center. Inspired in part by the racing car lines, they were added to the red streaks of the inner triangle of the "A" by creating a pinstripe effect that reﬂects the exclusivity, attention to detail and a strong focus on design. 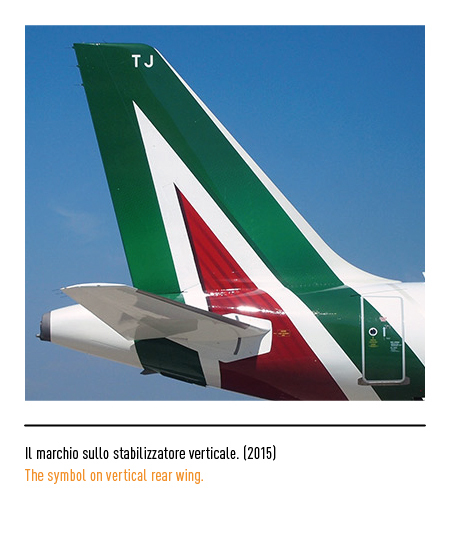 Fuselages not have more the green band and they are painted in pearlescent ivory color, representative of the Italian sobriety style; they have shaded transverse lines which extend up the vertical stabilizer to create the idea of ​​motion, speed and unhindered progress. 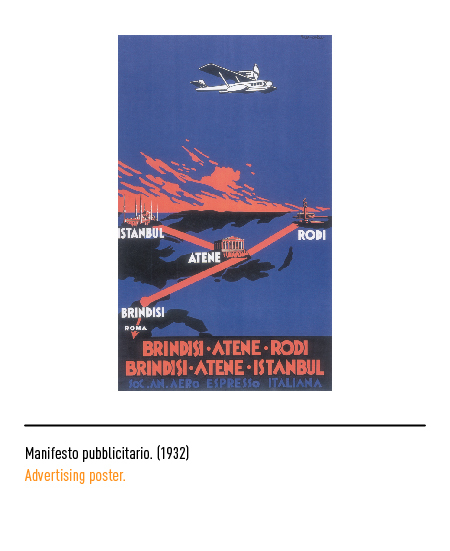 Giovanni Brunazzi, IMMAGINE COORDINATA 1, Gruppo Editoriale Forma, Torino, 1984. 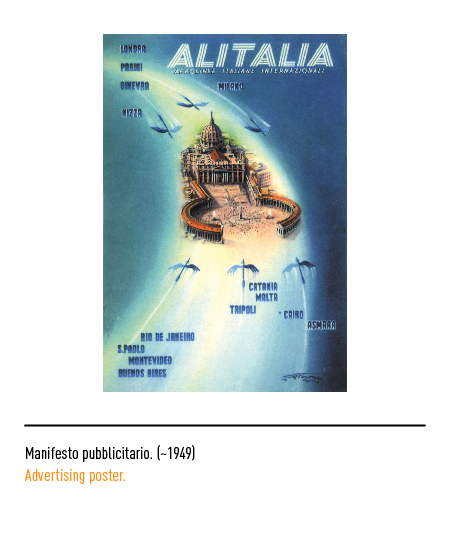 Annual AIAP, Associazione italiana progettazione per la comunicazione visiva, 1963. 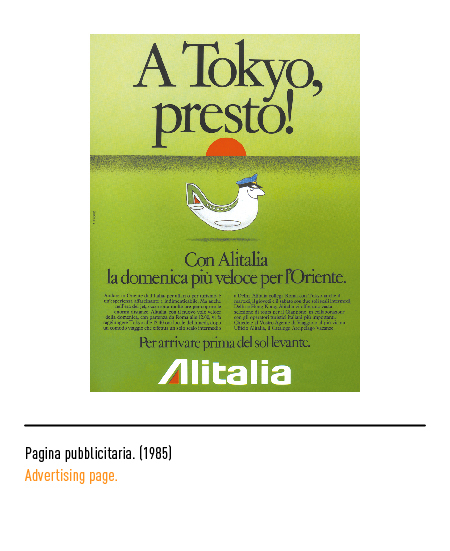 Silvestro Serra, “È tutt’oro quel che look” in Panorama, 1988. 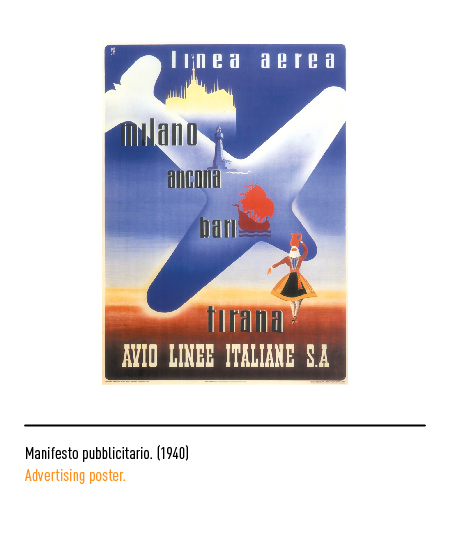 PLANESPOTTING Italian aviation posters 1910-1943, a cura di Maurizio Scudiero, Massimo Cirulli, Roberta Cremoncini, Publicity & Print Press, New York, 2002.